What are the main events in United States which will affect the global stock market? The Fed has finally ended the hottest topic in September with the decision of keeping rates steady. This signals the likelihood of a rate hike in either this November or December as the Fed hinted for one hike by end of the year. The reason why the rates remain unchanged was because the Fed wants more evidence of positive progression on employment and inflation. In Figure 1 below, the U.S. Non-Farm Payroll fell from 275 to 151 which suggests that a rate hike may not be a good move. In a bigger picture, the Unemployment Rate has dropped by 0.1% (from 5.0% to 4.9%) after the hike in rates in December 2015 as shown in Figure 2. However, inflation rate increased by 1.1% from 0.8% in July 2015 and above market forecasts by 1% as shown in Figure 3. Shouldn’t these reflect a good sign for the Fed to increase the rate to coordinate consumers’ sentiment so that demand will be softer? The truth behind the data are due to rising shelter (rental) and medical costs while food and energy index remains unchanged as shown in Figure 4. To summarise, the data does not reflect the improvement of overall economy, as the increase in inflation rate is due to rising shelter and medical costs (which is inelastic), while energy and food index remains unchanged. The market has actually priced in the catalyst of the US Fed as it estimated the chances of a hike at about 20%. Therefore, the impact to the market should be more towards the bullish side as the market has been patient since September. In other words, the Fed is expected to increase interest rates this December. This is because the US Presidential Elections 2016 will be held on 8th November, after the next Fed meeting. Both presidential candidates have declared that they will focus on exports. If the Fed were to increase the rate this November, wouldn’t this act against the political manifesto of the presidential candidates and wipe out the hopes of investors towards US market? If Donald Trump is chosen as the President, there are higher chances of the market being impacted negatively. The reason is, Trump has declared that “he will build a great wall between the border of US and Mexico, and demands the funds from Mexico” which has indirectly infuriated its key regional ally. Furthermore, he stated that he will increase import tariff to 35% and stop importing products made from China which is the largest trading partner of U.S. in a bid to rejuvenate the manufacturing industry. Assuming that U.S. loses its two major trading partners, lesser businesses will be trading in US currency, causing a drop in demand and a weakened USD. 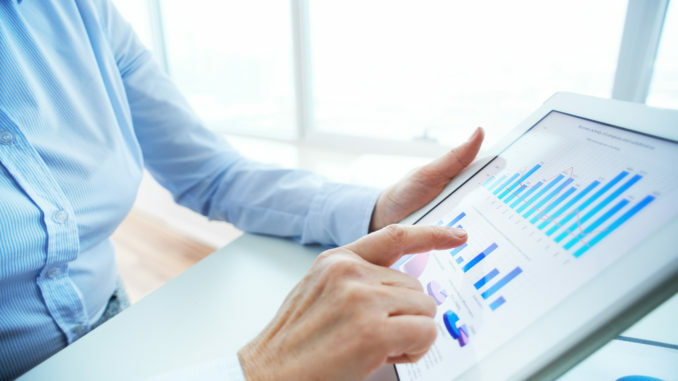 This will subsequently lower the confidence of investors towards the outlook of the U.S. market. This shows contradiction to his promise made during his presidential campaign which he claims to focus on exports after he is elected as President. This is because most of the American products like Apple, Microsoft and Ford will be unable to export to China anymore as well once U.S. stops importing products from China. When U.S. giant corporations are not doing well, this will certainly affect their economy. Unless, Trump has a better trading strategy policy which has yet to be announced and made known to the public. 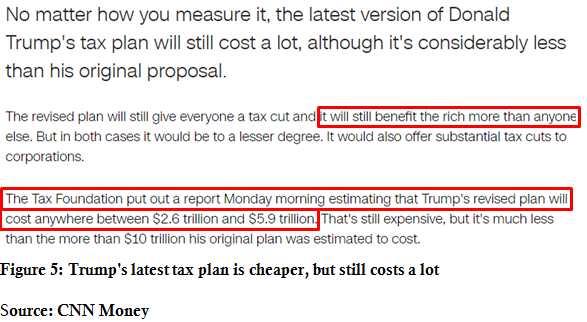 The 3 main different approaches by Trump compared to Hillary are lowering tax rate which allows companies to bring money back into the country and this will be more beneficial for the rich rather than the middle class as shown in Figure 5. The other approach used to attract more votes from the general public is that Trump will take extreme measures towards illegal immigrants due to increased crime rates perpetrated by immigrants in the country. Immigration has been a concern to the U.S. citizens as the people fear that they might be living in danger again since the September 11 attack. So, what if Hillary Clinton is elected as President, how will the market respond? Unlike Trump’s aggressive play against his allies (trading partners) like China and Mexico, she will strengthen enforcement on American trade to those not playing by the rules such as China’s dumping practice, and create tax incentives to encourage investment in hard-hit manufacturing sector to increase jobs. 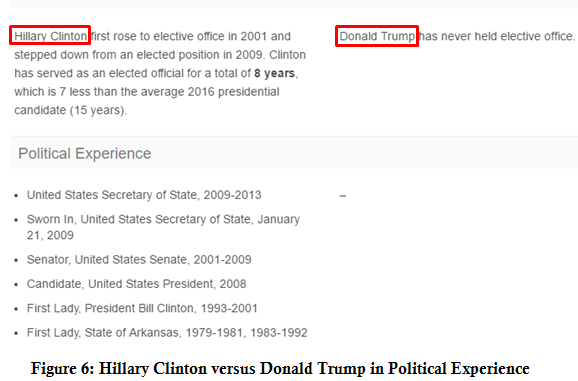 You can see that Hillary Clinton has more political experience than Donald Trump as shown in the Figure 6. She has also offered a wide range of detailed proposals while Trump only offered specific issues like taxes and trade in broad statements rather than details. In addition, Clinton suggested that the minimum wage will be increased in some states by while Trump suggested that the states should set their own minimum wages rather than setting a federal minimum wage. Besides wages, Hillary also focused on worker re-training by granting a tax credit for businesses at $1,500 per apprentice. All in all, you can observe that the policies proposed by Clinton is to increase productivity which will eventually strengthen the corporations and lower the unemployment rate for a better economy. The weakness of Hillary Clinton might be her softer approach towards immigration reform after she said to embrace the diversity and the value of keeping immigrant families together. This act has been criticized and she has been accusing of promoting “open borders”. Trump has opposed to the Trans-Pacific Partnership Agreement (TPPA) and same goes to Clinton unless those standards can be met. In other words, TPPA is likely to be set aside. In my opinion, the market might respond positively if Hillary Clinton is chosen as the next President. However, the uncertainty lies in the negotiation power of Clinton with regards to trading. If she intends to implement policies which could threaten China, China will also retaliate in kind. Also, she has opposed the current TPPA standards which will delay the progress of TPPA. As mentioned, I expect the Fed to increase the interest rate in December due to better economic data and to avoid conflict of political manifesto of the presidential candidates. The market, after the Fed meeting, might be better as U.S. corporations will not face challenges in regards of tightened financing and may also relieve investors’ pressure. In regards of US Presidential Election 2016, Clinton has vast political experiences and has made her plans and policies known to the public more than Trump. She is reputable in the political field whereas Trump is a greenhorn in this field. Hillary Clinton has the higher likelihood to be elected and this will strengthen the market outlook in my view. 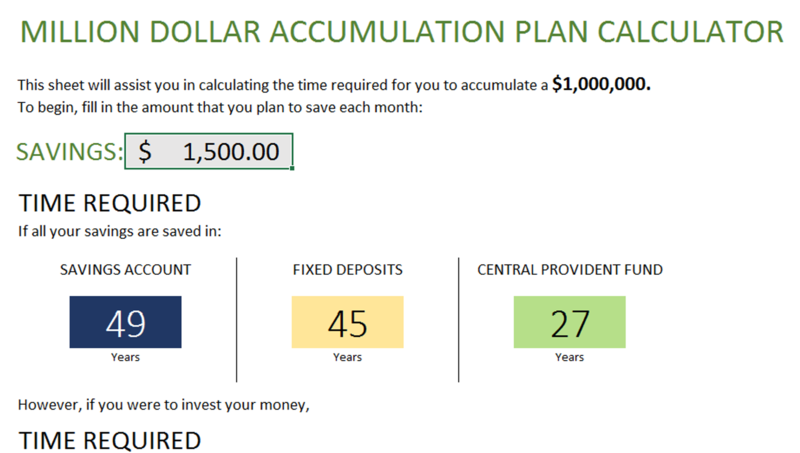 Get the Million $$$ Accumulation Calculator NOW! Join our mailing list to get the Calculator!